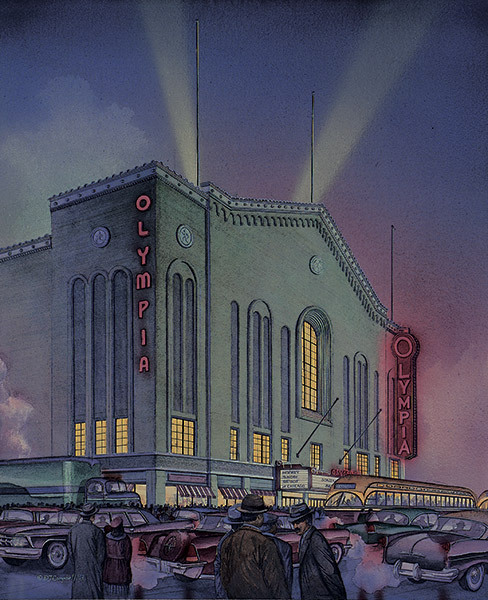 NHL Originals Six Arenas, Maple Leaf Gardens, Chicago Stadium, Montreal Forum, Boston Garden, Madison Square Garden and Detroit Olympia Stadium reproduced as Limited Edition Prints from Original Watercolor Paintings by Daniel John Campbell. Maple Leaf Gardens wss built in 1931, and has been a fixture in the Toronto entertainment scene, and the centre of English Canada's hockey world ever since. The Gardens symbolizes the "Golden Age" of Hockey and was the last one of it's era left. The Forum, home of the legendary Montreal Candiens, was built in 1924, renovated in 1949 and 1968, and may be the most famous hockey arena in the world. The painting shows the forum in the early 1960's from the corner of Atwater and St. Catherine's before an early winter game. Chicago Stadium has been one of the great buildings in sports. It opened in 1929, back in Al Capone's time. The Blackhawks played there since it opened and the Bulls since 1967. The stadium rose like a fortress above West Madison. The painting captures a night game when streetcars ran out front, the smoke lingers and diffuses the colours on a cold winter night. Madison Square Garden III, the "Old Garden", was built in 1925 and was home to the Rangers and Knicks until 1968. It was situated on Eighth Avenue, near the Hudson River Piers. The Garden has been the world's centre stage for both entertainment and sports, and has been a big part of the New York lore for the past century. The "Gahden" opened in 1928 and was the oldest operating arena in the U.S. It has been home to both the Bruins and Celtics and to many of New England's college and high school tournaments. The painting shows the Garden in the 1960's before a Sunday afternoon game, on a cold winter day. The "Old Red Barn" was home of the Red Wings for 52 years, and housed everyone from Gordie Howe to Elvis and the Beatles.